How often do you find yourself wanting to make a greater impact but wonder how do it? We help you to make significant changes in your life by working with you to create clarity of purpose. We then give you the necessary tools to harness your unique strengths, passions, and values to achieve your goals. Interdependence is essential for an organization's success. How well are your teams really working? Our custom workshops change the way you and your team work together. We provide an opportunity to create unity of purpose, and to harness the group's energy and strengths to become more cohesive, innovative, purposeful and productive. Are you looking to make a change in your life? Attend one of our leadership workshops to refresh your understanding of your unique talents and refine your authentic leadership style. These tailored workshops are perfect for individuals who want to jump-start their lives and achieve that next level of success. Leadership comes in many forms, and we offer a variety of programs to fit your needs including personalized coaching, corporate activities, theme-based workshops, and customized programs such as annual retreats. Our goal is to help you capitalize on your natural talents and abilities to break through the status quo and realize your full potential as an inspirational and authentic leader. ﻿The greatest value we bring to our clients is to create clarity of purpose, and then bring their vision to life with authenticity and passion. Each person comes into the world with unique personality traits, aptitudes, and experiences that color the way they see the world. Following the Spiraling Up Method, we walk you through a series of self-exploratory modules to help you build a strong foundation of who you are at a core level. We provide you with the tools, including cutting-edge assessments, to feel confident in your decisions knowing that you are aligning your gifts with your values, passions and purpose to better yourself and your community. How engaged are you both at home and at work? ﻿We don't talk much about our energy levels but we should. ​Our energy levels underpin everything we do, and are constantly spiraling up and down—often unconsciously. We all know how it feels to be “in the zone” vs. feeling stuck, overwhelmed, frustrated, and not in control. Imagine how much more you could accomplish by harnessing your energy to quickly “spiral up” when confronted with life’s challenges. 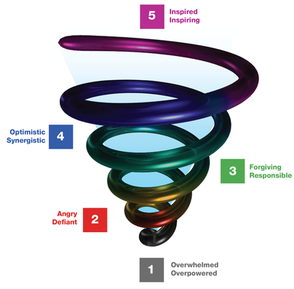 ​The Spiraling Up Method helps you to identify how you are showing up, and gives you the tools to increase your personal and team engagement to become more productive, purposeful, creative, joyous, and inspired. Contact us to set-up a free consultation today.